Meeting Cambodian documentary filmmaker Rithy Panh in Doha, during their annual Qumra event, was a real treat for someone who believes in the power of cinema with a conscience. Apart from the Doha Film Institute's wonderful meeting of talents held within the Souq Waqif and inside the Museum of Islamic Art each March and now in its fifth edition, Panh's presence felt historic. He was a Qumra Master in 2017, came back to teach a short documentary lab at the Institute in the summer of 2018, and now is back as a Mentor -- patiently watching works in progress and meeting with filmmakers to share his wisdom. I believe in cinema. I believe in the power of a great film to change my day, my outlook, my general mood. From watching movies for a living, I’ve learned to recognize how an uplifting story makes me feel better about myself, while a socially conscious one will awaken in me the stride to be better, do better. On the other hand, endless TV and violent films only fuel an inner aggression which makes me worst for the wear. I go out into the world more mad after watching a film I didn’t like. It’s as simple as that. Rithy Panh’s documentaries may not always make you feel better about the human race, but they certainly push you to become a more productive part of humanity. And in the process, change the world around you with the power of one. To those unfamiliar with Panh’s work, his films focus on the aftermath of the genocide by the Khmer Rouge in Cambodia and come from a personal POV since he and his family suffered greatly at the hands of the regime. His best known works include ‘The Land of the Wandering Souls’ (2000) and ‘Graves Without a Name’ (2018) and in 2017 he co-produced ‘First They Killed My Father’ directed by Angelina Jolie. 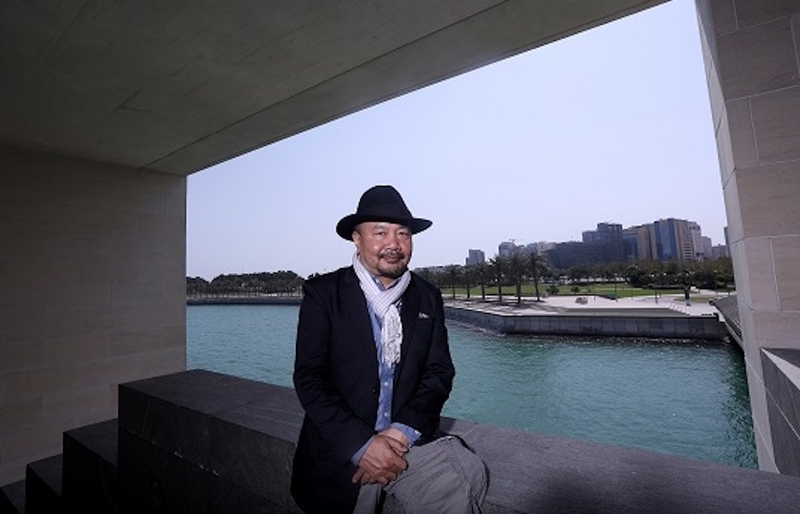 I sat down to ask Rithy Panh what draws him back to the Doha Film Institute and if he’s been able to work through his personal tragedies by making films. But also if he believes in the power of cinema to change the world. His answers gave me goosebumps. What inspires you to come here, time and time again? Rithy Panh: I think there is here a kind of energy. And it’s very interesting to follow up, not just come today and go away. I never did that. When I try to make something, I try to invest myself and to see something grow up which may need a little bit of time. Also, we have the same feelings, the same interest to help film directors. Do you think that cinema is a revolutionary art, which can create whole movements? Does cinema possess the ability to make people believe in their own power? Panh: Yeah, I think that you can show things and people can take the decision by themselves. Our responsibility is to reflect or transmit some view, and people can understand that they have the power to change things. If you want to change the climate for example, you have to start with yourself. And you start also so that everybody can understand it can happen to them. But I cannot change the climate with one film. Do you think that your cinema has helped you to heal, to come to terms with the horrors in your past? Panh: I’m not sure that cinema has this power either, but if you don’t talk about the complexities of the world, you communicate ignorance to the new generations. You know people say history doesn’t repeat but history is repeating all the time. And we live in a society where people forget very fast. We need entertainment of course but we need also a certain kind of cinema about identity, about social issues, about politics, about the world, about peace. It seems to me that we don’t retain anything, the image goes so fast. So you have entertainment and you have cinema. You have documentary films, you have fiction films, cinema that also has the duty to remind people they have a responsibility. That I believe strongly. Here there is an energy, people come from every place in the world and we can feel something, we can see something. You can help them, you can connect them, and I like that. I like transmitting and discuss with them, to be together with young film directors is very interesting. It keeps me young! What bothers you in the world today? Panh: What disturbs me now is that one day you can talk of this, and a week later nobody talks about it. Khashoggi, for example, for two weeks, three weeks it was every day. And what happened now? Who is responsible and why did they kill a guy like that? If a bomb is dropped on a house in Germany we talk about it for three days, and now we talk about the Mosque killings. Big crime becomes a banality. We talk for entertainment. And cinema is not like that. It is to keep good distance, take the time, build the story, build a reflection. It’s about distance, while we are living in a time when we hear everything and we retain nothing. Listening to you, I was thinking we are bombarded with catch phrases and words, on the news. But when we watch a beautiful documentary, we are actually absorbed by the images. Those are much more haunting in our memory. Panh: The power of cinema is to give you the capacity to open your mind. Open your eyes, be sensible to what happens. It’s not only about watching images, it’s about the feelings and who we are. Do we share something, do we belong to the same humanity or not? I often say that solidarity or generosity is not something we are born with. If you want people to live together and share something, you need to make them feel that. Cinema has this power.